This wax-based medium can be used to add non-fading colour or a gilded finish to materials such as metal castings, filigree, brass stampings, ceramics, wood, etched glass, polymer clay, resin and more. Gilders Paste is formulated with the latest metallic, organic, synthetic and iron oxides with the highest colour fastness available. It can be applied as it is to clean dry oil-free surfaces with a cloth, cotton swab, sponge or your finger. Alternatively use paint thinner to create a paste, paint, stain or wash. Blending of colours with a paste knife can achieve some amazing effects. I use this product by dry brushing onto my wood turned items that I have textured and detailed. The effect you can achieve is amazing. See www.timberly.co.nz for examples. The paste comes in the form of a thick paste, stored in a small tin. Smooth surfaces should be slightly roughened with fine grit sandpaper or steel wool before application. Gilders Paste dries to the touch in 10-15 minutes and completely dries in 12 hours with no tacky residue. Choose from 27 UV resistant colours which can be layered to create stunning and unique finishes and textures. Note: larger tin size (4.0oz / 92ml) available on request. Please contact timberly@xtra.co.nz to order. Price: $26.95. Rejuvenate this product or use as a thinner to blend colours and create sensational effects. Overseas postage by quotation. Please email timberly@xtra.co.nz for quote. 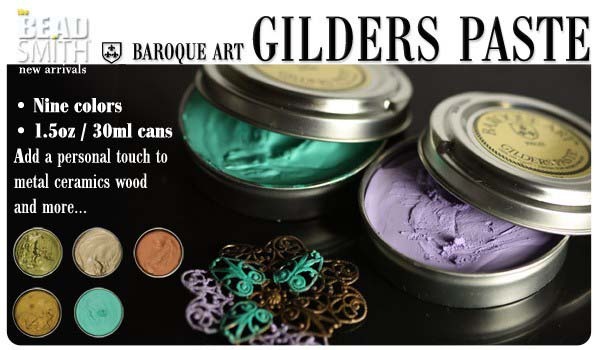 Click the button below to add the Baroque Gilders Paste (Full Range of Colours) to your wish list.